New tiki mug by illustrator artist Andrew Kolb for TikiFreek. Las Vegas, NV, April 12, 2019 --(PR.com)-- Andrew Kolb is an artist, designer, and illustrator. Shortly after obtaining his diploma in graphic design at Conestoga College he continued on to the Queensland College of Art in Brisbane, Australia, for his Bachelor of Design. Andrew has been featured in numerous galleries, countless exhibits, and a number of respected publications. He has collaborated with clients ranging from start-ups to major television networks on everything from fitness apps to animated shorts. Kolb recently illustrated the new "Spider-Man: Far From Home: Spider-Man Swings Through Europe!" book available on Amazon. TikiFreek was lucky to grab him and get him out of his comfort zone. 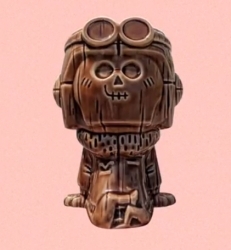 TikiFreek being a Tiki Mug retail website, asked him if he would design a tiki mug for the site. He said that he would and mentioned that the "Test Pilot" was the first Tiki drink he tried. He asked if he could design something around that premise. With that in mind he decided on a sketch and TikiFreek created the mug with LunacyFX in Florida. The 3D design was done by "Thor" in LA who has worked for TikFarm and has created over 600 mugs. The release party is April 18th at Golden Tiki in Las Vegas and on TikiFreek.com. Andrew Kolb is from Kitchener, Ontario.